Let’s face it, y’all. Cell phones are here to stay and they are firmly in the hands of the kids in your children’s church. As children’s ministry leaders, we have to set boundaries on when and how the phones can be used. What better way to take control of cell phone usage then integrate the phones into your teaching sessions? When you’re done using the cell phones, have a tray or a bucket to collect phones with. 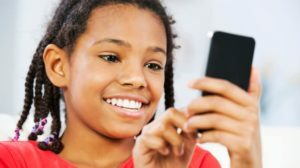 Keep in mind you’ll need internet access in your facility and not all kids will have phones You may have to have the kids group together to share them for these ideas. Message the answer: Write your cell phone number on a white board so everyone can see it easily. Ask them a trivia question about the current lesson and ask them to text you the answer. You could make the first person or group to respond is the winner. Send an emoji: Play a True and False game with kids. Read them a verse (or incorrectly read them a verse) and have the kids send you en emoji in response. A smiley face is correct, a sad face is false. Play me a song: Award Bible bucks to kids who play a clip of their favorite Christian song. Find the verse: Write the web address of your favorite bible search site on the board. Show kids how to search it then call out verses and have them search for them. When they find the right verse, tell them to text you the chapter verse. Or you could tell them to search certain words like love, donkey, cross etc and text you a chapter and verse. These are just a few ideas on how to teach using cell phones. Feel free to share yours too! I read this article and have read similar articles over the past couple of years. I was at CPC this year and many of speakers mentioned using kids cell phones as a ministry tool. Do that many elementary aged kids have cell phones? I am at a growing church in a pretty affluent area, and while most of our youth bring their phones with them, I have yet to see a single phone brought by the children. In my class of 30 5th and 6th graders, not one has ever brought a cell phone to church. Most parents I know wait until their kids get older before getting them a phone. Is my church a cultural anamoly? I think most parents in my church tell the kids to leave them at home (or in the car) during service. So when they come to kids church it’s not a problem. It would be great if someone made a chromecast interactive Bible game/curriculum. As a family sometimes we sit around the tv with our tablets and play games like uno. Tony Kummer (Editor) reviewed & updated this page on : February 29, 2016 at 10:23 pm. All our content is peer reviewed by our readers, simply leave a comment on any post suggest an update.